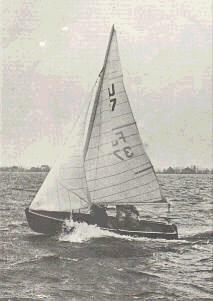 The "Flying Dutchman Junior" was originally designed, in Holland, by Van Essen, a well­known Dutch boat designer. Listed as co­designer was Conrad Gulcher, Dutch Olympic sailor. (Gulcher and Van Essen also collaborated on the Flying Dutchman Conrad Gulcher served as International Class Secretary for both classes for many years, and was a main driving force behind both the International Flying Dutchman, and International (FJ) Flying Junior classes until his death in 1989. The first FJ was built of cold­molded wood, and was tested on the water in December, 1955. The original purpose of the "Flying Dutchman Junior" was to serve as a junior trainer for the then new Olympic Flying Dutchman (FD). The FD is a much larger( 19'10"), faster, and more physical class than its younger sister. The FJ rules also allowed (and still allow) many of the same technical innovations as the FD, and the boat was (and still is) ideal to teach newer sailors the intricacies of tuning, mast rake and bend, etc. so important to top-level competitive sailing. The Class' name was quickly changed to "Flying Junior" as the class developed on its own, and the Flying Junior Class Organisation was free and independent of the Flying Dutchman organisation by about 1960. By the early 1970's, the Flying Junior was accorded the status of an International Class by the International Yacht Racing Union (IYRU)- pre-cursor to the ISAF. This prestigious status is applied only to sailing classes with strict one-design rules, that are sailed the world over, and that regularly have international competition- such as World and Continental Championships. The International Sailing Association (ISAF) (replacement organisation for the IYRU) currently governs the Class Rules of the International FJ Class. 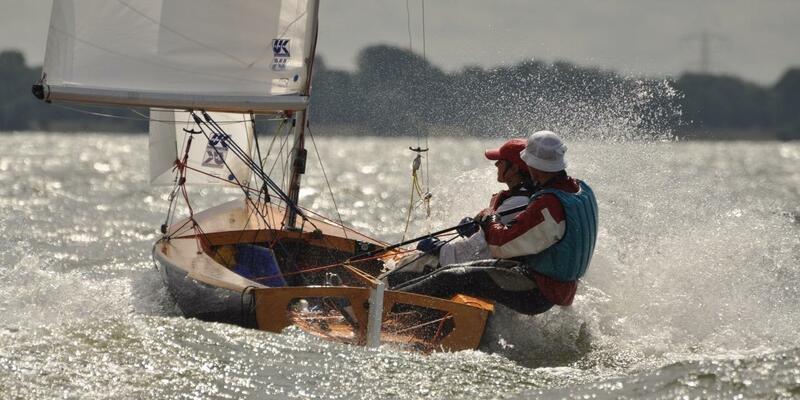 As an International Class, rights and control of the boat design rest with the International Sailing Federation (ISAF). Today (2000), the International FJ is sailed in Japan, Germany, Italy, Belgium, The Netherlands, and the USA. The Class Rules of the FJ allow any deck design; Dusseldorp FJs utilised a doublebottom design, especially suited to open-water sailing. Note the open transom, allowing large amounts of water to escape almost as fast as it can enter the hull. These hulls were the fastest FJs for at least the first 15 years of the Class' existence. They are still competitive today. From the beginning, the Class Rules of the FJ allowed any individual, or company to build the boat. Class Rules Evolution- a summary of major revisions made to the Class Rules Early 1960's, the Class Rules were modified to lengthen the mast, providing more speed, and clearance under the boom. Early 1970's, the Flying Junior became the International Flying Junior. Accordingly, FJs built since 1972 must carry the IYRU "Builder Fee Paid" metal plaque permanently affixed in the cockpit, signifying that the IYRU royalty has been paid. These fees are the only source of income for the International Class. In 1980, recognizing that the name "Junior" did not accurately describe the current usage of the boat, the International Class changed the name to "International FJ". 1980's included a larger spinnaker (from 80 sq. ft. to about 88) and allowed shape cut into the sail (the original spinnaker rules required it to be two flat planes of cloth). Under the new rules, the bigger size, plus spherical cutting of spinnakers give a much faster sail. In 1990, the International Class added the trapeze for the crew, (added for the U.S. class in 1994). Officially, the crew must be at least 12 years of age to use the trapeze. Under consideration, as of 1/1/00:a larger spinnaker, slightly larger main.